Granite is a prized building material. Its combination of strength, beauty, and durability make it a favorite natural stone product for use as a window sill, flooring tile, or countertop surface. Obtaining a supply of top-quality granite stone at wholesale prices is easy, and the price of granite is actually quite affordable. Stonexchange is a direct importer and distributor of granite window sills. We use Absolute Black Granite and this is a natural granite. Our company imports pre-cut black granite sills and delivers them to customers from our Miami-based warehouse center. 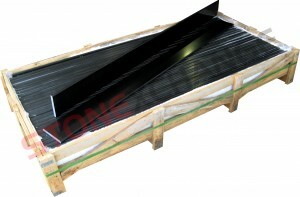 Direct import of black granite window sills means savings for our valued customers. We work in partnership with quarrying operations and cutting specialists, and our shipments come to our Florida headquarters ready for final delivery to the contractor. Because we order our supplies in bulk, we enjoy lower than average freight costs. We pass this savings on to our buyers. Black Granite window sills are not very common and mostly used in commercial spaces. Because we only work with builders, subcontractors, building supply outlets, and flooring product retailers, our larger shipments result in a per-piece cost that is far less than what the competition has to offer. Orders for black granite window sills require a minimum of 50 pieces, meaning that the retailer can always keep a large stock in inventory when buying direct from our company. We have a constant supply of granite window sills being shipped from our overseas manufacturing company. Customers can expect 24-hour processing of their order, and we ship nationwide in specially designed wooden crates that protect the granite from damage. Stonexchange gives you the advantage of not going through custom fabrication. We do stock some select sizes such as 74”X6”. Absolute Black Granite window sills are available in 74″X6″X5/8″ for larger window frames, and 37″X6″X5/8″ for smaller size windows. The product is available as a level surface piece or an expertly beveled sill. If the customer requires a custom length or width, we will work directly with our manufacturer to design a special order. Our bulk ordering format means lower prices on granite window sills. All of our products are shipped as full containers, and we enjoy lower freight costs as a result. Large supply centers wanting to maintain a full inventory of granite products can rely on our company to provide regularly scheduled delivery, and each order can be for any amount of product so long as the minimum piece count is purchased. Granite is one of the hardest natural substances. It is a mix of two compounds, formed under intense heat and pressure. Most granite is speckled with tiny quartz fragments. This presents a beautiful pattern and makes for a very appealing building material. Granite is cut from quarries in large slabs and then cut into smaller pieces for use as tile, countertops, thresholds, or window sills. Standard sills are flat and rectangular, but specialty saw equipment can produce double-beveled sills that can also be used as shower curbs and floor thresholds. Builder instructions often call for China Black or Black Galaxy granite, and our Absolute Black product works well when these shades are desired. Our granite sills are pre-polished. When they arrive at our Florida headquarters, we give them a thorough inspection to make certain that the quality meets or exceeds the customer’s expectations. Smaller orders are packed into wooden crates that stack together when loaded onto the freight truck. Larger orders are packaged overseas and are ready for transport to the customer upon arrival at our warehouse. Granite requires only a suitable substrate material for installation. Window frames are generally made with a 2-inch thick wood base, with vertical framing underneath to support the heavy granite. Many windows have finely crafted millwork around the sides and below the granite sill, but the stone itself rests directly on a firmer wood base. Contractors installing granite window sills need only remove the pieces from the carton, apply the sealant to the substrate, and fit the stone into the frame. The expert cutters who manufacture our sills use advanced equipment to make certain that every piece is accurate in length, with variances of less than one millimeter. Granite is cut using a special saw blade that is coated with diamond dust. This results in very sharp cuts that are perfectly square, with no chipping around the edges. Double-beveled sills are made using a special saw that resembles a planer. The result is a perfectly curved piece of granite, ready to be sent to the polishing equipment. We supply granite products to building material outlets, construction companies, and stone flooring retailers. We order our product in bulk and have a constant supply of Absolute Black Granite coming into our distribution facility. As a result, many of our customers will find exactly what they need simply by contacting our service agents. Smaller retailer and construction companies can take advantage of our large inventory if they wish to order the minimum amount of product. For example, orders for 50 granite window sills can be processed in less than one day and sent via freight service anywhere in the continental United States. We contract with several different freight companies and work hard to ensure prompt delivery with a guaranteed arrival date. Large outlet distributors and home improvement stores can order thousands of sills if they desire. These orders generally involve a larger lead time for processing because the granite is shipped in bulk from our manufacturer. Our customer service representatives can give all pertinent information concerning large orders, when delivery can be expected, and how to arrange for custom cut pieces if non-standard sizes are required. Larger orders require between two and three months to process, import, and deliver. However, we can set up a repeat order request for those customers who need to maintain a large inventory. Our company does not generally have non-standard sizes in stock at our Miami distribution center, nor do we perform cutting operations locally. Satisfying the customer is our top priority. Our business involves overseas shipping, quality control, and rapid delivery of the world’s finest granite. Our success depends on how efficiently we perform our import operation, and our goal is to deliver the product to our customers exactly when it is needed. Our company not only imports the finest granite window sills available, we also specialize in thresholds and shower stall curbs. Builders and subcontractors wanting to fill orders for both granite and marble can take advantage of our expertise in the natural stone importing business to procure top-quality granite floor thresholds, marble flooring tiles, and a variety of curb styles. We import standard double-beveled thresholds and Hollywood thresholds in Nuevo White Carrara, Crema Sahara Marfil, and Pure White Thazoz. These products are available in 36-inch lengths, and widths from 2- to 6-inches. The same granite product used to manufacture our window sills is also made into floor thresholds and bathroom curbs. Custom requests for non-standard sizes may be possible so long as the customer orders well in advance. Because we import various natural stone materials on a constant basis, construction companies and flooring product specialists find it easy to place a complex order containing window sills, curbs, and thresholds. This is often necessary when a large building contract calls for specific materials and different types of sills or thresholds for each house or commercial property. We welcome all prospective buyers to compare our prices and delivery service to any other distributor of natural stone products. Our prices are extremely affordable, and we pride ourselves on our rapid delivery to customers nationwide. Building contractors and home improvement centers requiring a steady supply of product can rely on us to deliver bulk shipments on time, every time. Because of the ever-changing economic landscape as well as the rise and fall of inventory requirements reflecting the building season, customers need to know exactly when they can expect product delivery. They also need reassurance that they will not be assessed fees simply because of a change in product quantity from one order to the next. Our company provides flexible ordering and is happy to arrange smaller shipments without attaching monetary penalties or adjustment fees. Our company offers the finest granite window sills for sale at well-below market prices. We guarantee the quality of our products and look forward to a long-lasting relationship with our retail customers. Use the handy contact us page to find out how easy it is to obtain the world’s finest granite window sill products on the market. Our customer service agents will take the information and give an immediate price estimate that includes probable delivery time. Remember, we ship nationwide and carry most granite window sill products in our Florida distribution center.